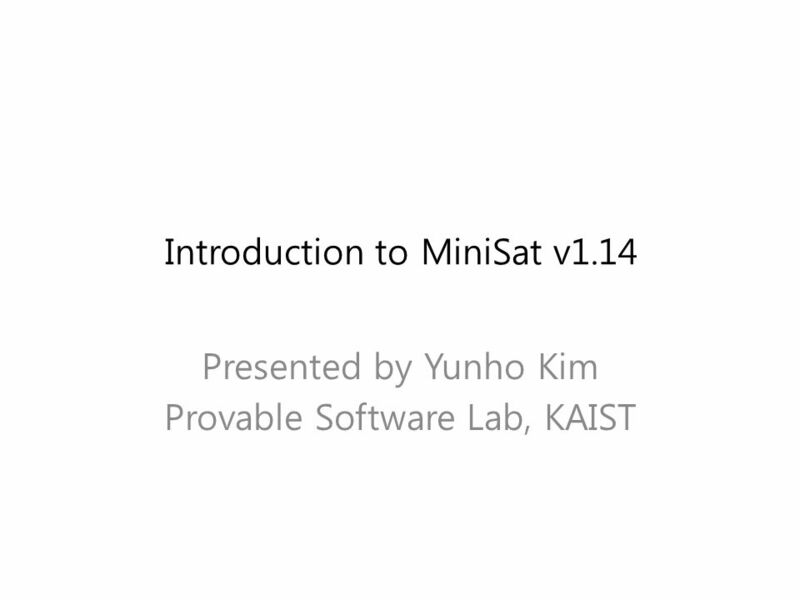 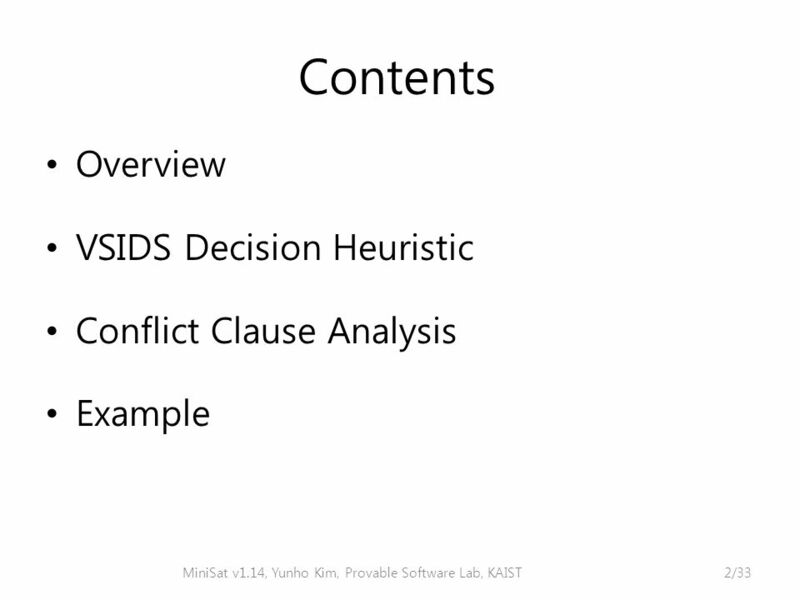 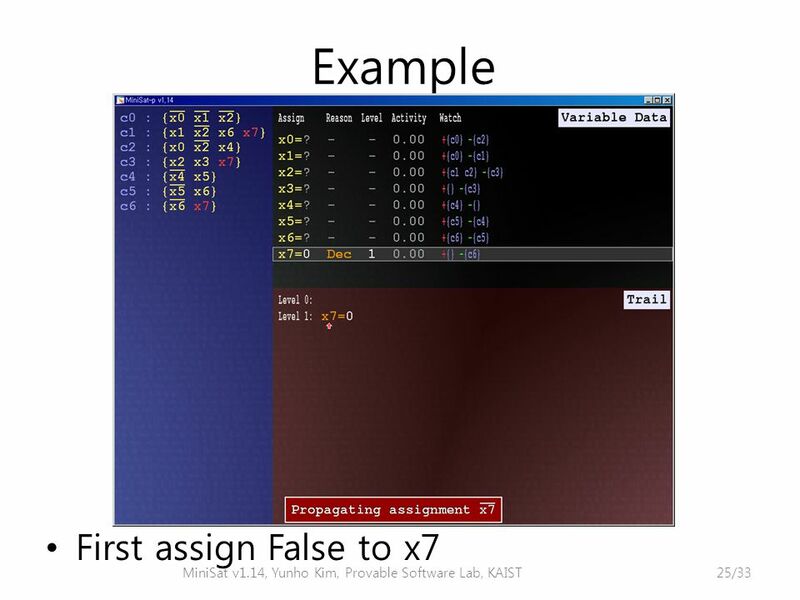 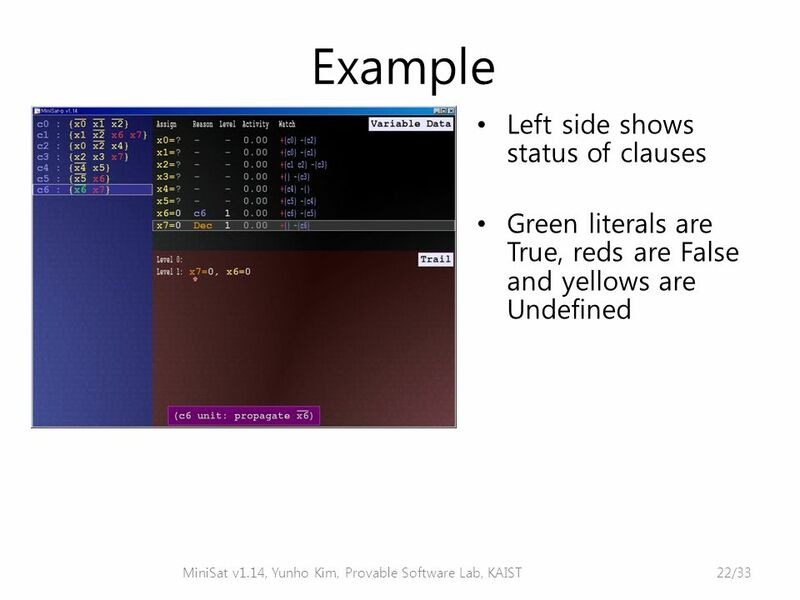 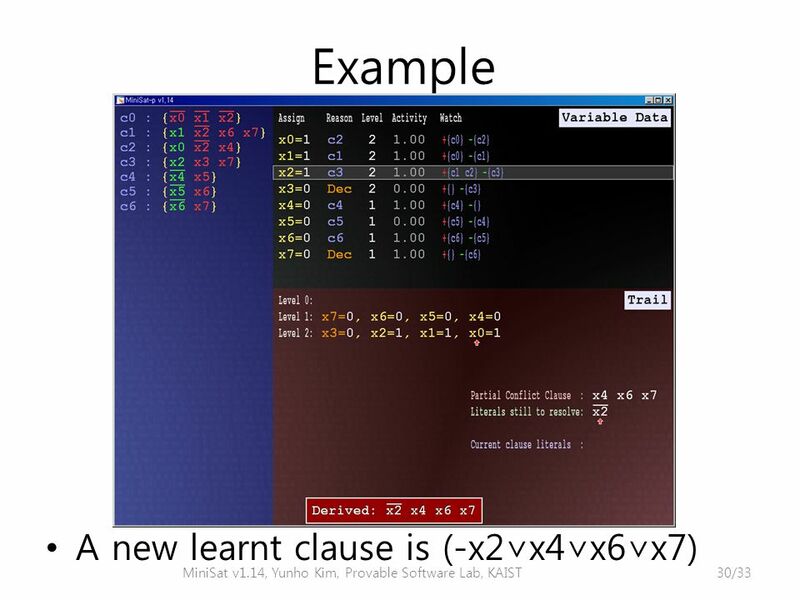 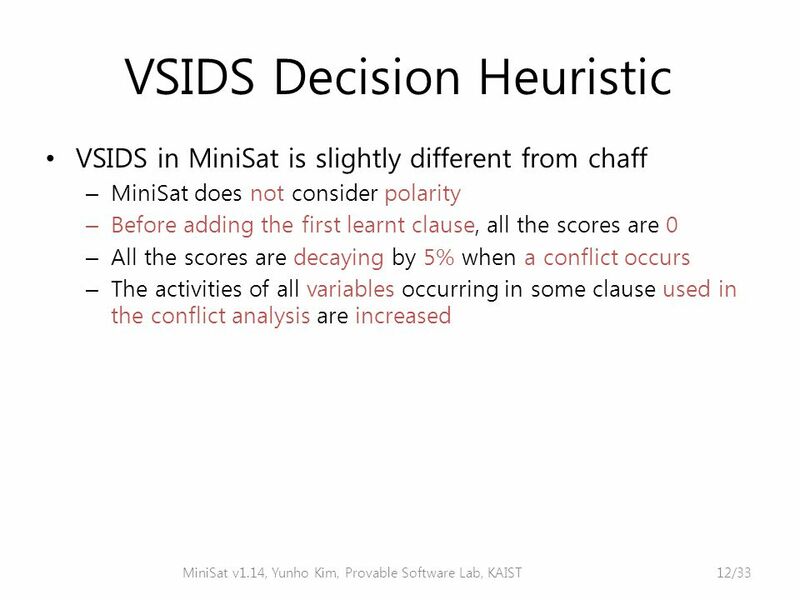 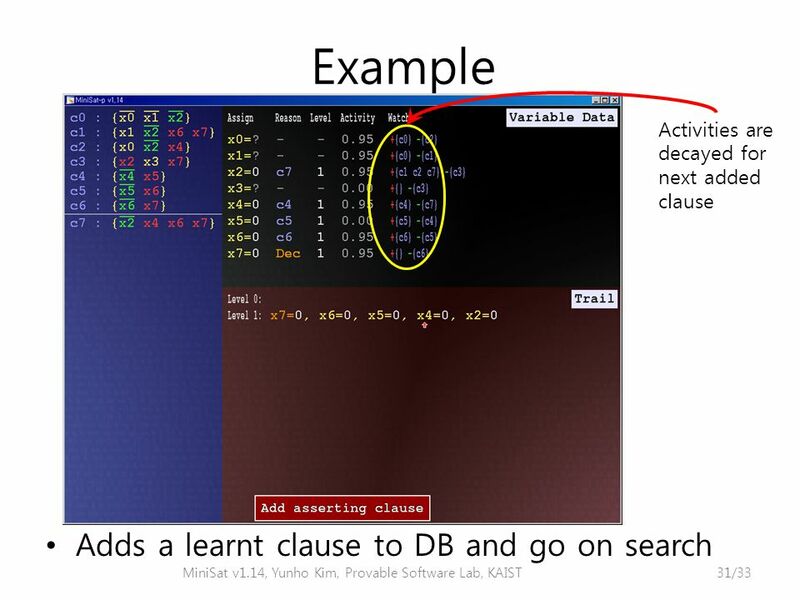 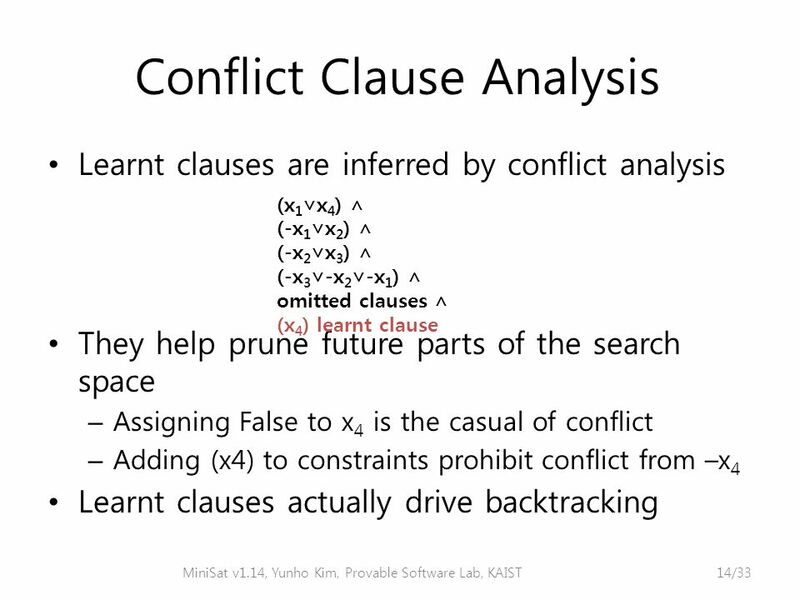 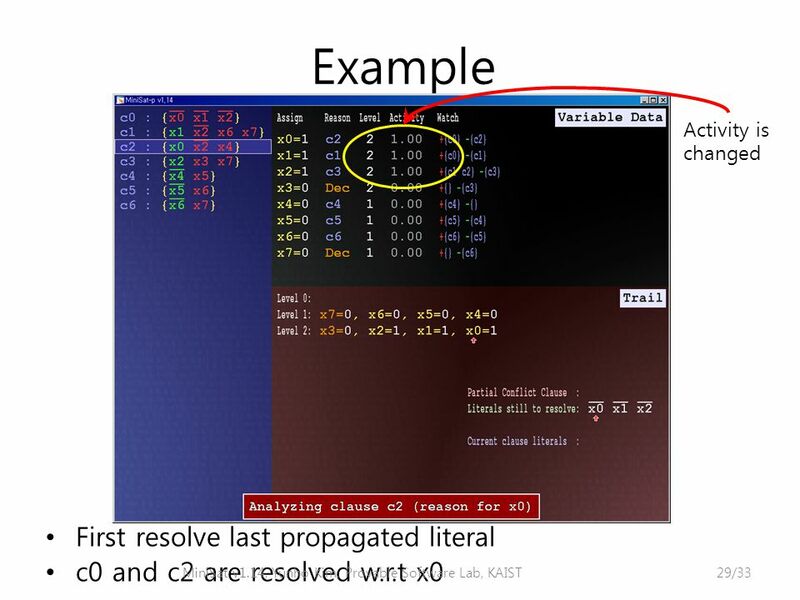 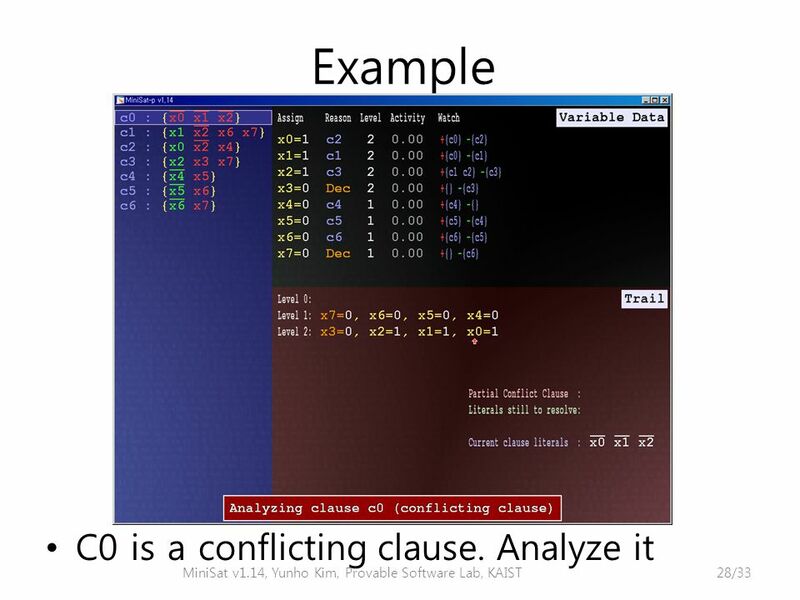 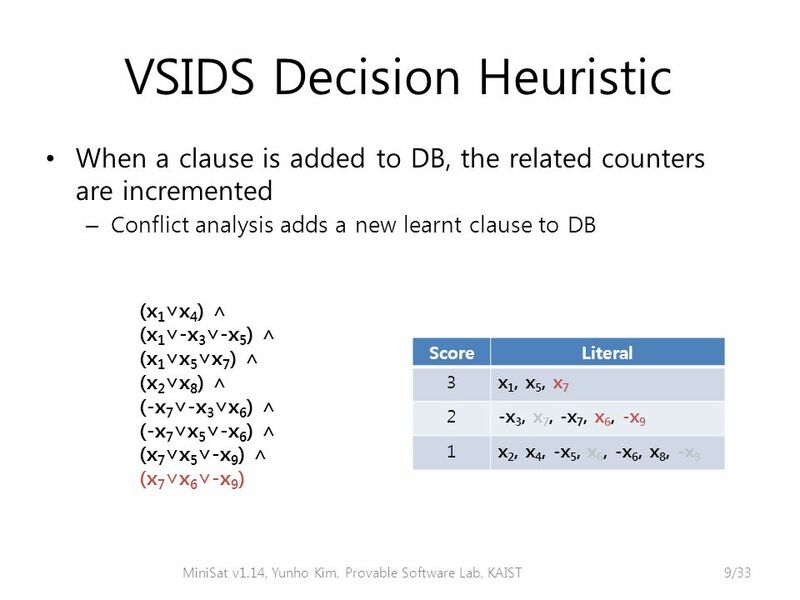 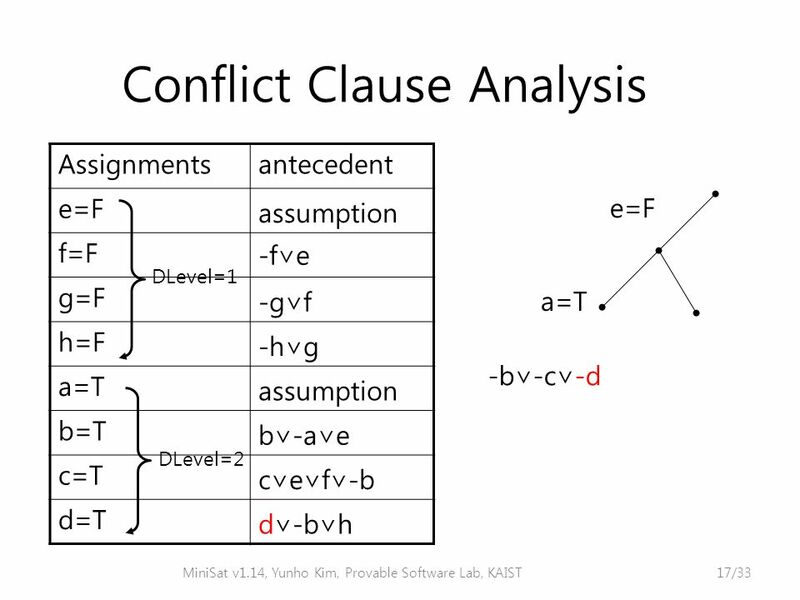 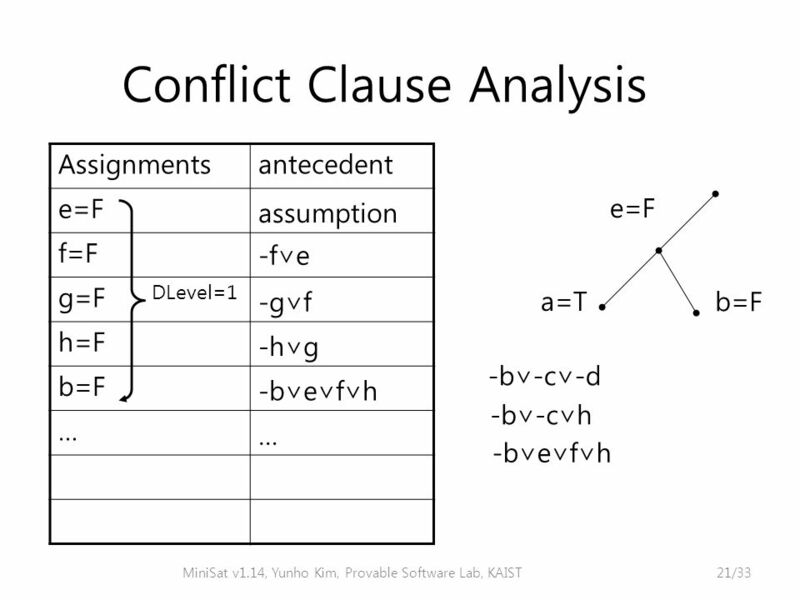 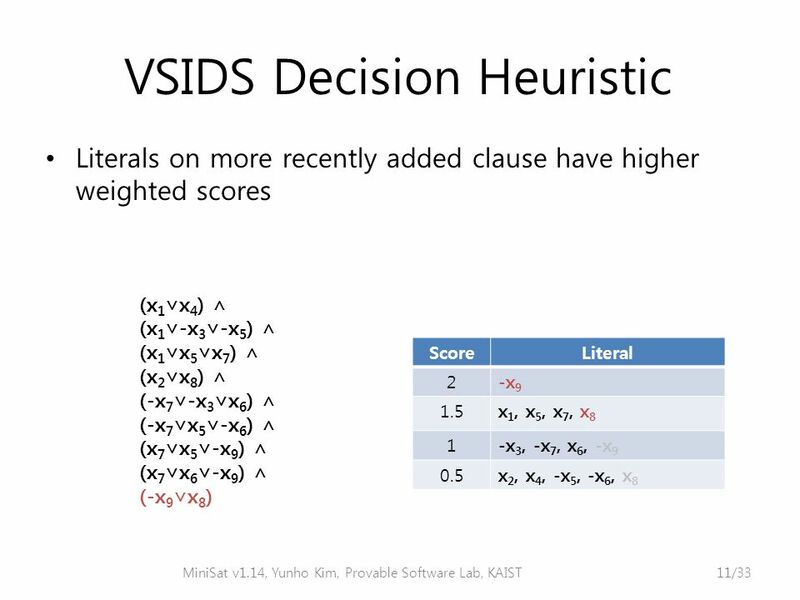 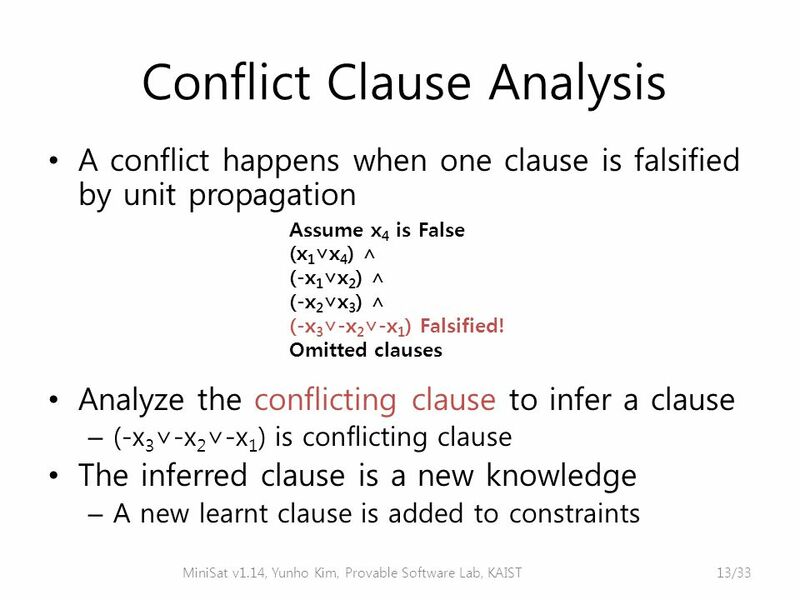 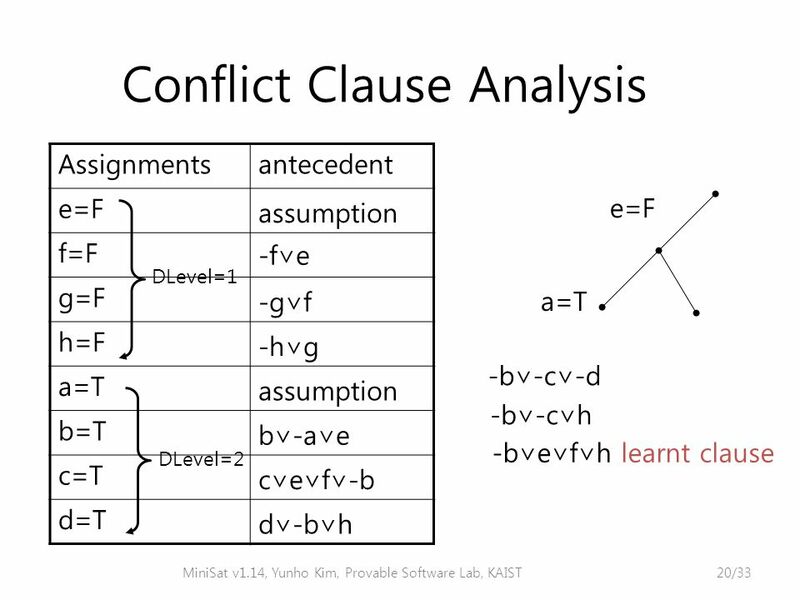 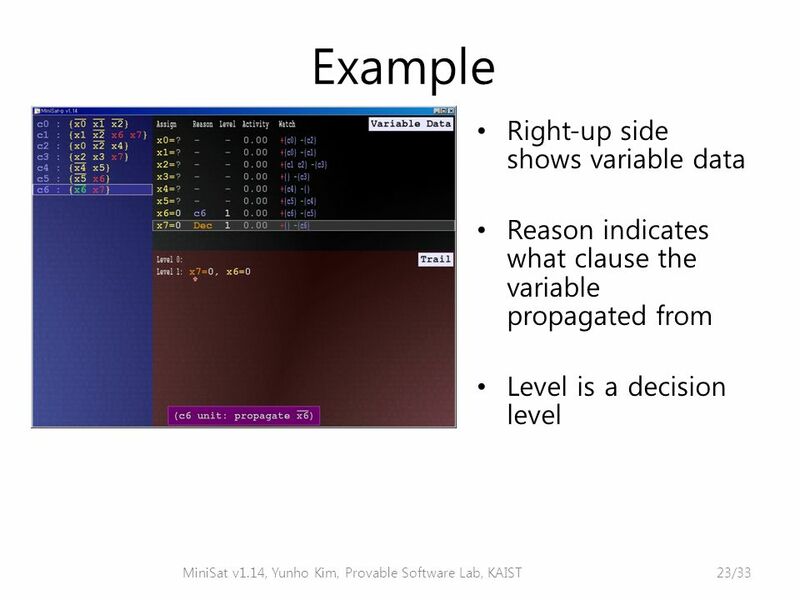 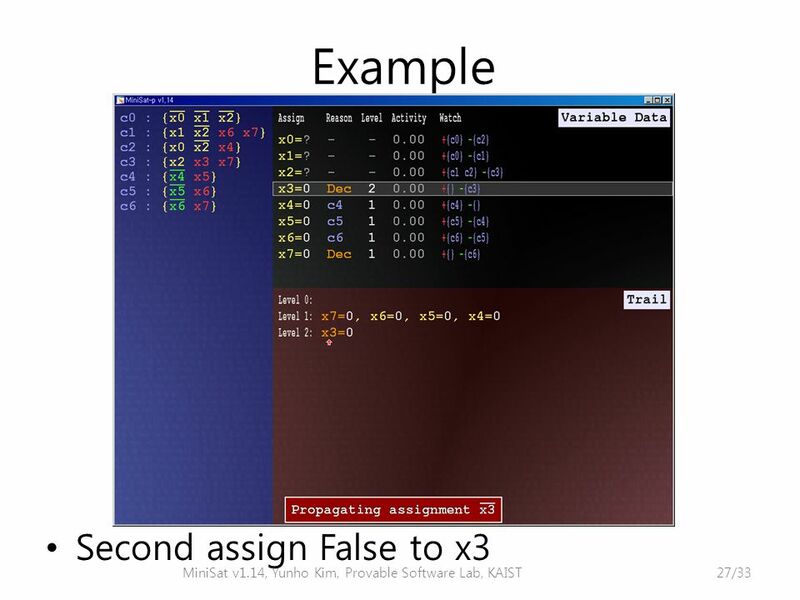 Introduction to MiniSat v1.14 Presented by Yunho Kim Provable Software Lab, KAIST. 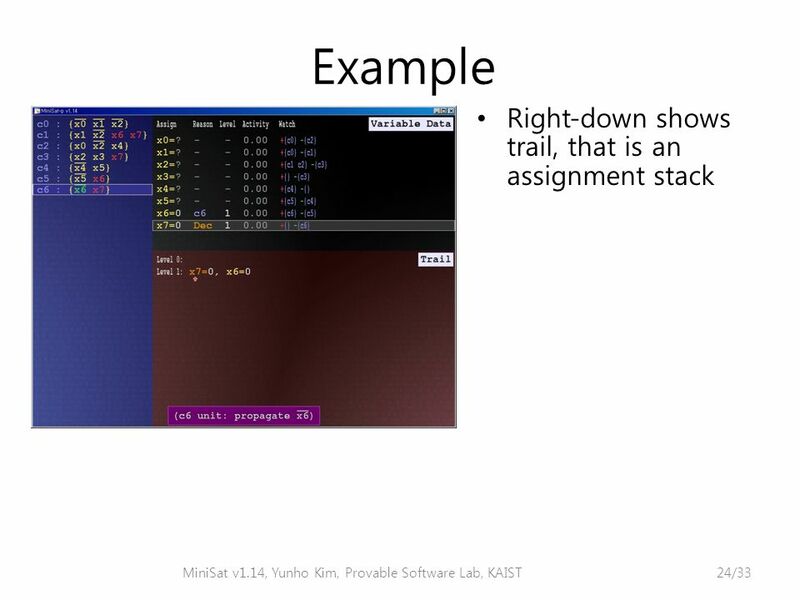 Download ppt "Introduction to MiniSat v1.14 Presented by Yunho Kim Provable Software Lab, KAIST." 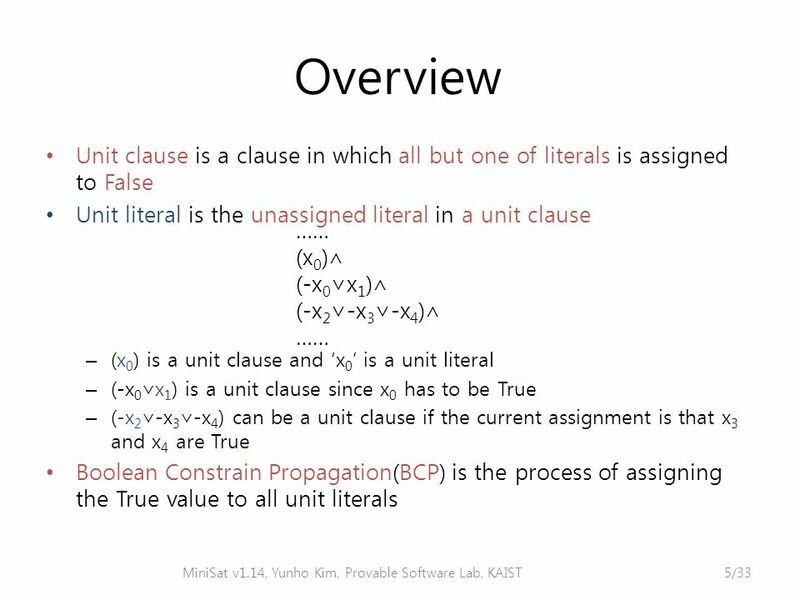 The Project Problem formulation (one page) Literature review –“Related work" section of final paper, –Go to writing center, –Present paper(s) to class. 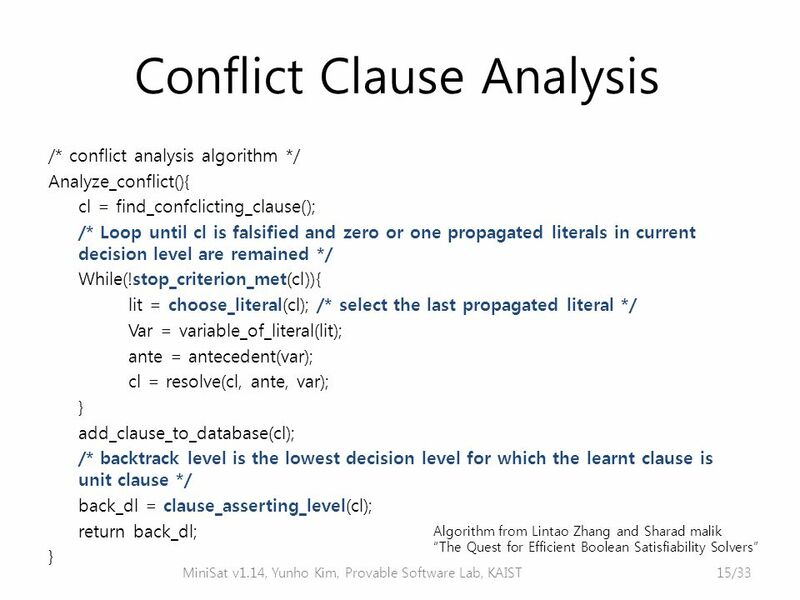 SAT Solver CS 680 Formal Methods Jeremy Johnson. 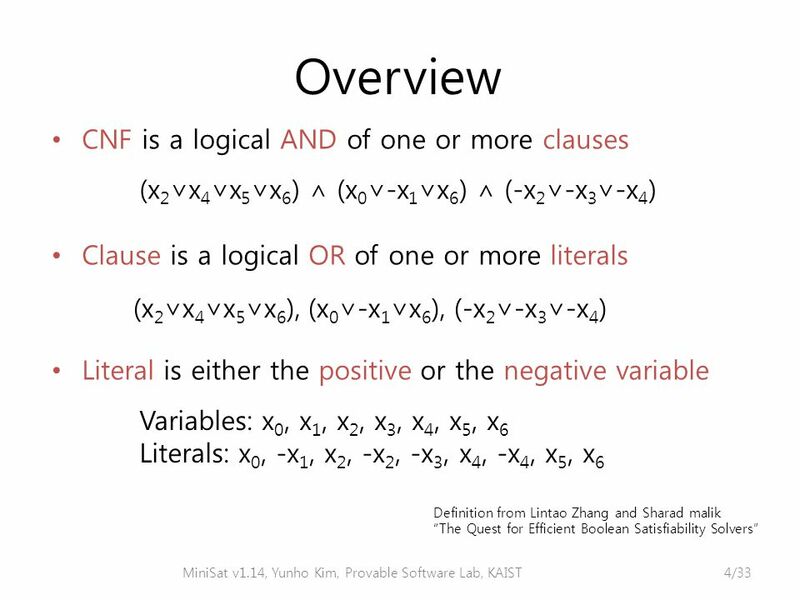 2 Disjunctive Normal Form  A Boolean expression is a Boolean function  Any Boolean function can be. 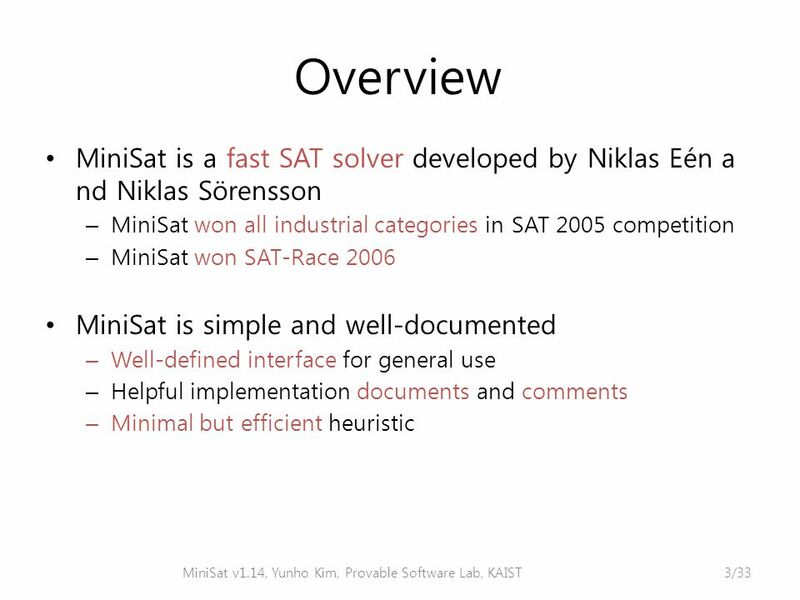 Chaff: Engineering an Efficient SAT Solver Matthew W.Moskewicz, Concor F. Madigan, Ying Zhao, Lintao Zhang, Sharad Malik Princeton University Modified. 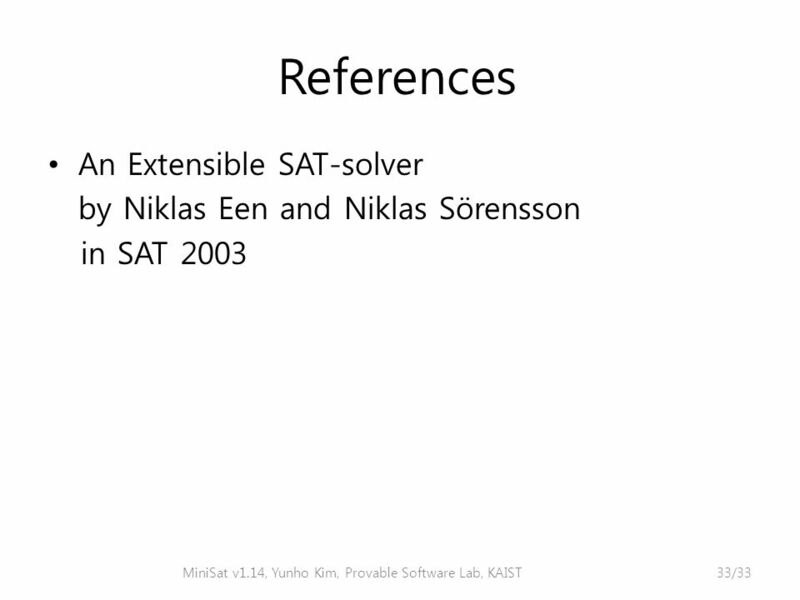 Presented by Monissa Mohan 1.  A highly optimized BCP algorithm  Two watched literals  Fast Backtracking  Efficient Decision Heuristic  Focused on. 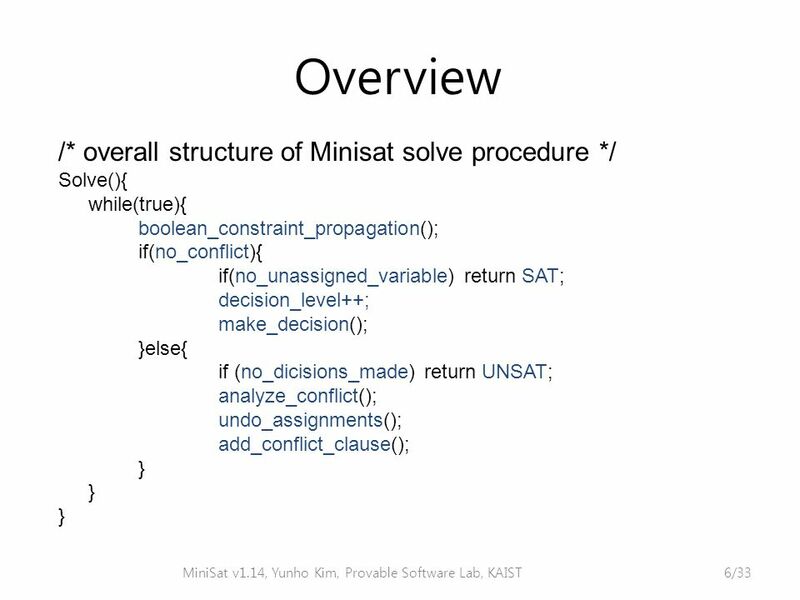 “Using Weighted MAX-SAT Engines to Solve MPE” -- by James D. Park Shuo (Olivia) Yang. 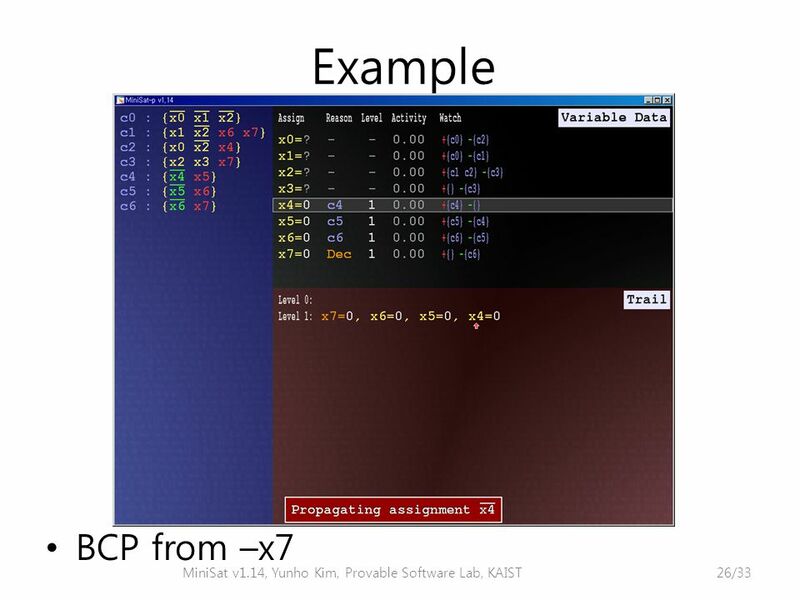 CPSC 422, Lecture 21Slide 1 Intelligent Systems (AI-2) Computer Science cpsc422, Lecture 21 Mar, 4, 2015 Slide credit: some slides adapted from Stuart. 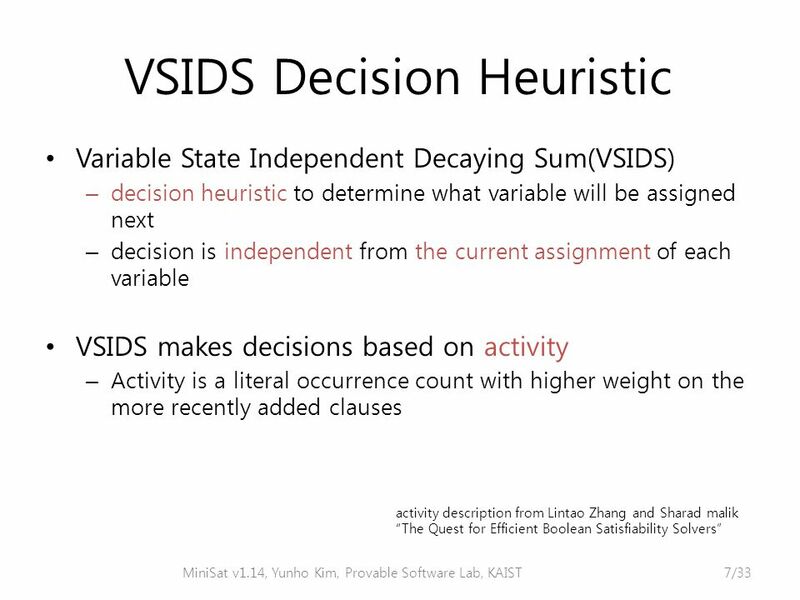 Heuristics for Efficient SAT Solving As implemented in GRASP, Chaff and GSAT. 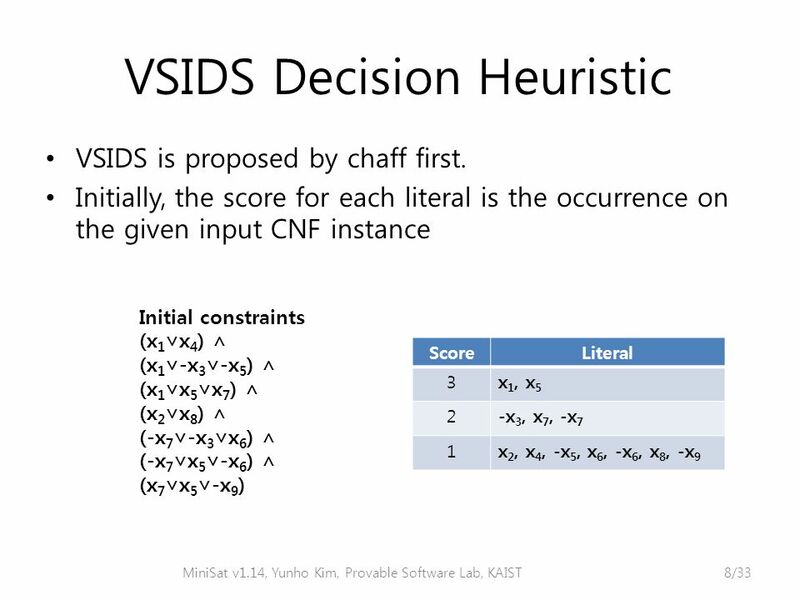 ECE 667 Synthesis & Verification - SAT 1 ECE 667 ECE 667 Synthesis and Verification of Digital Systems Boolean SAT CNF Representation Slides adopted (with. 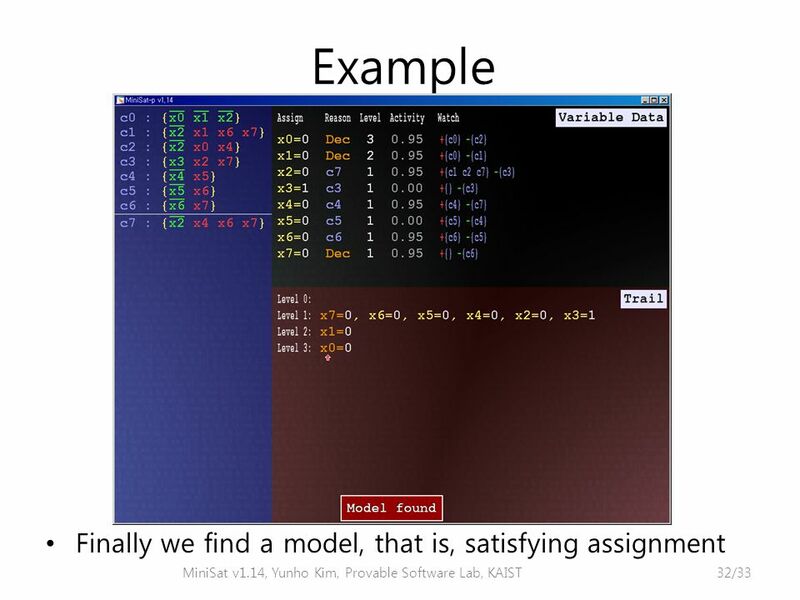 INTRODUCTION TO ARTIFICIAL INTELLIGENCE COS302 MICHAEL L. LITTMAN FALL 2001 Satisfiability.